WEST PALM BEACH – Over 200 guests and 20 nominees were in attendance at the Kravis Center for the 22nd Annual Giraffe Awards Luncheon on March 30 when the 2017 winners were announced. 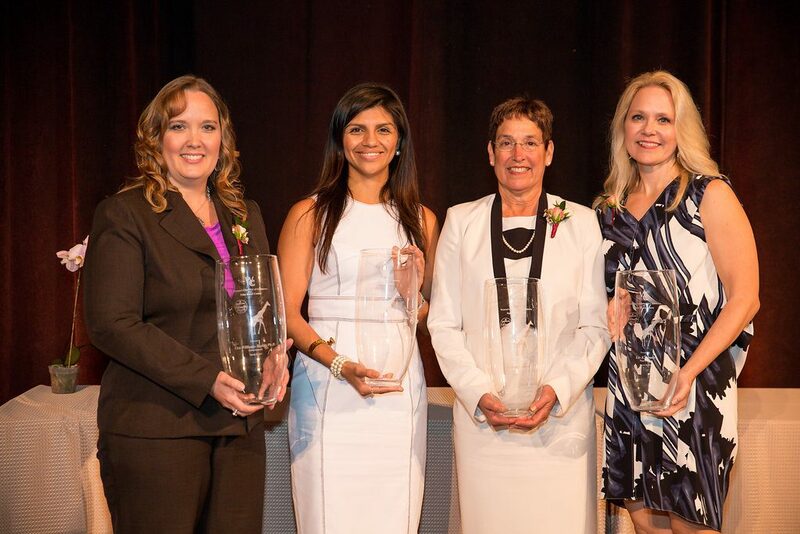 Four Giraffe Award recipients were chosen from among 21 outstanding nominees who have “Stuck Their Necks Out” for other women in Palm Beach County. A separate Giraffe Business Award was presented to First Bank of the Palm Beaches. The 2017 Giraffe Awards recipients were selected from four nominee categories. Pictured left to right are Lisa Williams-Taylor, CEO, Children’s Services Council of Palm Beach County (Government), Kelsey C. Burke, Esquire at Lytal, Reiter, Smith, Ivey & Fronrath (Young Professional), Roxane Kennedy, retired Vice President of FPL’s Power Generation Division (Business), and Liv Vesely, President of the Jupiter Medical Center Foundation (Nonprofit). Chamber President Heather Gray observes that “This year’s winners truly exemplify the strength, leadership, and success stories that characterize the Women’s Chamber of Commerce.” Special membership discounts are available through April 14, 2017. Prospective members may call the chamber administrator at (561) 659-0285 or sign up online at www.womenschamber.biz. The Women’s Chamber of Commerce of Palm Beach County was founded in 1994 by a handful of businesswomen who envisioned building the Chamber into the leading business organization for women in Palm Beach County. The Chamber fulfills its mission to empower members and to advance women’s leadership in the local economy through networking, professional development, and community engagement. The Women’s Chamber Foundation serves members and women in the community by raising funds to support scholarships for deserving women and girls who aspire to achieve economic success through higher education.